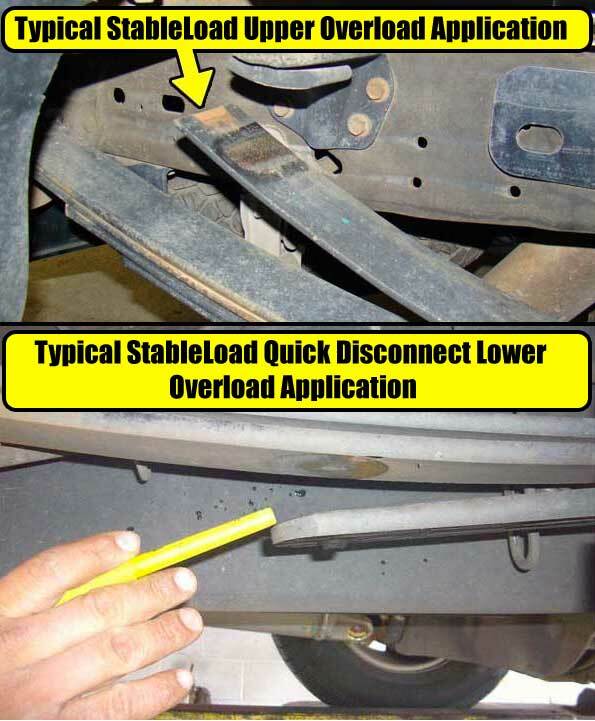 The StableLoad® dramatically improves vehicle handling characteristics by "pre-activating" the stabilizing effect designed for rear springs by keeping them actively under load the way your vehicle factory engineers designed them to operate. Click here to watch our StableLoad videos! StableLoad is engineered for trucks, SUV's, vans, commercial applications and other vehicles equipped with lower overload springs that come already pre-drilled from the vehicle manufacturer (see application guide). The StableLoad Quick Disconnect no-drill kit (part number A7310) is available for a very quick and simple no-drill installation with amazing results. Each precision crafted StableLoad kit carries our Legendary Lifetime Warranty and is proudly made in the USA. The StableLoad Quick Disconnect (lower overload) Part #A7311 (with drill kit) is designed as a universal vehicle application for trucks, SUV's, vans, commercial applications and other vehicles equipped with lower overload springs that -- DO NOT -- come already pre-drilled from the vehicle manufacturer (see application guide). The StableLoad Quick Disconnect DRILLING REQUIRED kit (part number A7311) is available for installation with amazing results. This kit comes with two specially treated drill bits and specific instructions for drilling the required (four) 7/16" diameter holes through the ends of the lower overload. The average time to complete the drilling process is approximately 35 minutes. Each precision crafted StableLoad kit carries our Legendary Lifetime Warranty and is proudly made in the USA. StableLoad is engineered for Ford, Dodge and GM trucks fitted with factory upper contact overloads (see application guide). 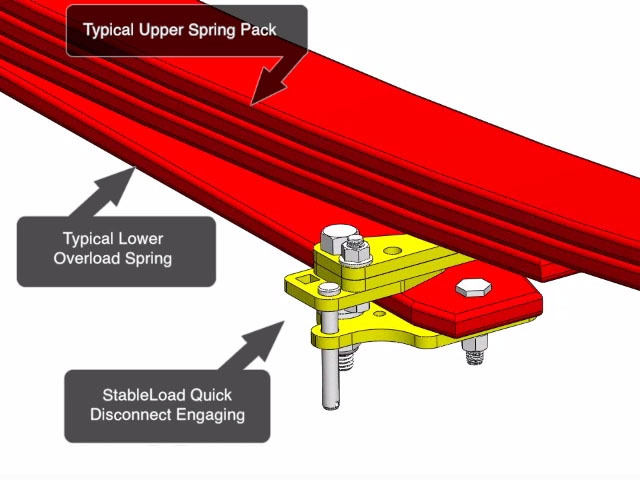 Torklift's StableLoad for upper overload applications is designed to replace the smaller, inefficient factory overload bump stop pads, putting the upper overload springs to work sooner. It dramatically stabilizes the vehicle suspension and makes the vehicle's passengers and load significantly safer. The StableLoad upper overload is available for a very quick and simple no-drill installation with serious improvement results. This is accomplished by bolting each of the StableLoads (four per kit) onto each overload frame bump stop pad (front and rear passenger side, front and rear driver side) StableLoad kits work equally well with or without aftermarket airbags overloads. Each precision crafted StableLoad kit carries our Legendary Lifetime Warranty and is proudly made in the USA. If you're unsure whether you need the StableLoad Upper Overload or StableLoad Quick Disconnect (Lower Overload) applications, click here.